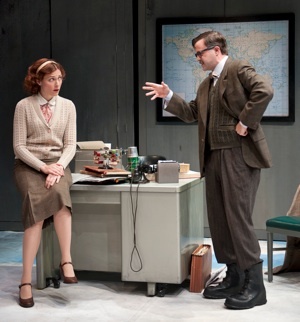 Peace in Our Time: A Comedy is an adaptation by Canadian playwright John Murrell of Shaw’s 1938 play Geneva. As the Shaw Festival website states, “This is the second of our Shaw ‘remixes’ where we’ve given a late, great Shaw play to a living Canadian writer to re-write, re-interpret and re-imagine as he sees fit”. The obvious question this raises is that if the Festival really does view the late play by Shaw as “great”, then why give to another playwright to mess with. The fact that the cheery message from the Festival conceals is that it views some of Shaw’s late plays as problematic and in need of “rewriting” to please a modern audience. There are several difficulties with this attitude. First, if a festival dedicated to presenting plays by Shaw cannot present the plays as he wrote them, who else will? Second, the idea that a Shaw play needs adapting suggests that the Festival has worries about its namesake playwright. This season there is no play by Shaw at the Festival Theatre, one at the Royal George Theatre and the only other Shaw is this adaptation. This situation conveys a lack of confidence in Shaw whether the Festival means to or not. Third, a contemporary Canadian adaptation of a play by Shaw means that an audience with neither be seeing a play by Shaw nor a play by the Canadian playwright but some amalgam that is neither fish nor fowl. 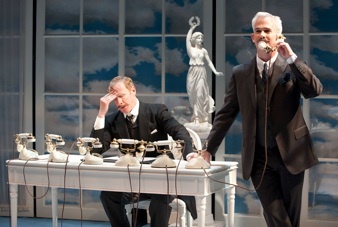 In 2011 Michael Healey was asked to adapt Shaw’s 1933 comedy On the Rocks. All he could think of doing was to present the two acts in the reverse order. That suggested that there really was nothing wrong with the original text by Shaw that needed adapting. Fourth, when playwrights adapt a play for a contemporary audience, how do we know they are not committing the same follies as Restoration playwrights did when they adapted Shakespeare to suit contemporary tastes and thus gave plays like Romeo and Juliet (William Davenant’s version in 1662) and King Lear (Nahum Tate’s version in 1681) happy endings? Contemporary tastes change. The texts themselves, barring new discoveries, do not. As it turns out, Murrell stays very close to Shaw’s original scheme. He keeps Shaw’s setting of Geneva in 1938 and the sequence of acts – Act 1 in the Office of the International Institute for Intellectual Co-operation, Act 2 in the Office of the Secretary of the League of Nations, Act 3 somewhere overlooking Lake Geneva and Act 4 in a Salon in the Old Palace of the Hague. His only change is to have the characters picnicking outdoors in Act 3 instead of dining indoors in “a fashionable restaurant”. He even keeps almost all Shaw’s dramatis personae, only omitting a couple superfluous characters, although he alters most of their names. Murrell’s greatest changes do not, in fact, influence the main themes of the play. First, the bored British secretary, Begonia Brown, who works in the Office of the International Institute for Intellectual Co-operation, he changes into a brash, cheerfully ignorant American whom he calls Liberty Belle Brown (Diana Donnelly). Begonia Brown’s regional preference for Camberwell over Peckham, Murrell changes to Belle Brown’s preference for her home state of Ohio over neighbouring Indiana. Second, the man Shaw refers to only as the Newcomer “speaking English like a shopkeeper from the provinces, or perhaps, by emigration, the dominions,” Murrell decides to turn into a Canadian from Winnipeg named Darcy Middleman (Andrew Bunker). All the well-worn jokes poking fun at Belle Brown’s provincialism and narrow-mindedness and at Middleman’s dullness are Murrell’s. Murrell also beefs up the role the American journalist Bob Tarkenton (Kevin McGarry), whom Shaw calls only “The Journalist”, and peps up his lingo so that he talks more like newspapermen in 1940s American movies. Murrell’s only other change to the characters is to change Commissar Posky from the Politburo from a male in Shaw to the female Commissar Poskaya (Moya O’Connell). Otherwise, Murrell retains the course of Shaw’s plot and the nature of his characters to such an extent one wonders what need for an “adaptation” there really was. What the Shaw Festival production paradoxically demonstrates is that all Geneva really needs to be stageworthy is judicious editing to improve the pace of the action and the removal some of the repetition that had accrued in Shaw’s many rewritings of the text between 1938 and 1947 as he tried to reflect the rapidly changing developments in European history. The plot in both Shaw and Murrell begins with Miss Brown as the focus. One by one representative characters of different countries come to Brown’s normally deserted office to lodge complaints. First is a Jew, whom Murrell gives the name Joseph Rubinstein (Charlie Gallant), who complains that he has been expelled from Germany, his own country. Next, is the Canadian who wants his Wagner-loving Prime Minister not to visit Germany. Then, in both Shaw and Murrell is the Latin-American Widow (Claire Jullien), who tells a complex tale of murder and revenge and wants the League of Nations to condemn her and her husband the President to death to put an end to her guilt for killing his lover. Following her is an English Bishop (Michael Ball) who wants the League to stop Communism from infiltrating England. He immediately meets Commissar Poskaya, who want the League to stop Anglican missionaries from converting Russian Communists. All of these cases Brown decides to refer to the International Court in the Hague. While this causes the Secretary to the League (Jeff Meadows) much confusion, it is perfectly pleasing to the Senior Judge of the International Court (Sanjay Talwar), who is overjoyed finally to have real cases to try even if the League lacks any ability to enforce the Court’s decisions. The most remarkable act of the play is the last where the three main fascist leaders of Europe appear to answer for their crimes. Shaw calls them Signor Bombardone, Herr Battler and General Flanco. Murrell, in his author’s notes, says, “I felt we were ready, in our time, to call them by their real … names, and to confront the gigantic clownish catastrophe of their arrogant menace even more directly than Shaw felt he could”. Yet Murrell simply calls them “Il Duce” (Neil Barclay), “Der Führer” (Ric Reid) and “El Generalíssimo” (Lorne Kennedy). No matter what Murrell thinks, it’s much more impressive that Shaw satirizes them to the extent that he does when they were alive, than to do so long after they are dead. Murrell follows Shaw’s handling of the trial scene closely and preserves many of its most salient points in direct quotations form Shaw. The Senior Judge is sure that “Where the spotlight is, there will the despots be gathered”. What is most infuriating is that Murrell changes Shaw’s ending and thus makes nonsense not just of Shaw’s strategy but his own. When the various complainants we met in Act 1 assemble, they wonder why so few people are attending this momentous trial. The Judge informs them that the trial is being televised and will be seen in all the major capitals around the world. The League may not be able to take action against them, but this televised trial will show the world what these three mighty men really are. In Shaw the Judge turns off the television cameras after everyone has left. In Murrell we learn at the end that the cameras were never on. This bizarre twist on Murrell’s part ruins the whole point of the final act. Less important but equally odd, Murrell makes the Judge, who has been the prime moral authority in the play, into a liar. In Shaw, he learns during the trial that the earth’s orbit will leap by a quantum that will destroy all life. He announces this to the court and when all have left asks the Secretary if this could happen. In Murrell, the Judge makes the same announcement but we discover he has made it all up just as a way of clearing the court. Having ruined the ending, Murrell then tacks on a “here’s-the-moral-of-the-story” speech, common in middle-brow drama and notably lacking in Shaw’s text. As with Michael Healey’s adaptation of Shaw in 2011, Murrell’s improvement turns out to be inferior to Shaw’s original conception. Enormous credit goes to director Blair Williams and his dynamic cast for making this botched adaptation as lively and entertaining as it is. Among the major roles Diana Donnelly seems to be channelling Sarah Palin to make Belle Brown so hilarious as a proudly Republican airhead. Sanjay Talwar, in contrast, speaking with a careful Dutch accent, is persuasive as the play’s unassuming yet inwardly powerful embodiment of reason. Jeff Meadows is amusing as the perpetually flustered Secretary to the League, though it would help if his accent didn’t wander back and forth across the Rhine. Among the dictators Neil Barclay clearly takes the prize. He makes Il Duce a pompous egomaniac we would like to ridicule except for his sinister thuggishness. In this Barclay captures the essence of the 1930s fascists who people first saw as buffoons until they began to kill people. Ric Reid avoids any previous caricatures as Der Führer. He is just the opposite of the shouting maniac of newsreels. Reid fulfills Shaw portrayal of him as chillingly soft-spoken and reserved like a psychopath. His exchange with Joseph Rubinstein about why Jews are not welcome in Germany is the most frightening moment in the play because Reid shows us how much effort Der Führer needs to control himself. Of the three, Lorne Kennedy is the least effective mostly because his indeterminate accent makes him hard to understand. At least he makes the key point Shaw gives El Generalíssimo clear – that the world is divided into gentlemen like himself and “cads”. Here Murrell usefully substitutes the word “deviants” for “cads” to make the speech more disturbingly relevant. The various observers and complainants at the court make up a pleasantly motley crew. The most sympathetic of these is Charlie Gallant, who plays Rubinstein with great sensitivity. At the opposite extreme is Claire Jullien, who is having a ball playing the mad, hot-blooded, extremely bigoted Latin American Widow. It is a treat to see Jullien show off her talent for comedy. Andrew Bunker’s Middleman is meant to be a stereotypic Canadian, except that Murrell makes him so argumentative and Bunker makes him so loud that he does not live up to the others’ description of him as dull and quiet. Kevin McGarry does a great job of playing the part of a pinup boy for 1940s-style all-American masculinity. Camellia Koo has designed a marvellously imaginative set that easily morphs from one location to the next. She brings out generally surreal nature of the last act with all-Lucite furniture and a Magritte-like backdrop of clouds in a blue sky as if the trial were taking place in a heavenly court rather than on earth. Victoria Wallace indulges her sense of humour in creating a wide range of costumes reflecting the regional styles of the international cast of characters. No one will ever claim that Geneva is one of Shaw’s best or even third-best plays. It focusses on Miss Brown for three acts only to ignore her in Act 4. Of al the grievances brought forth in Act 1, only two are even raised in the trial scene because Shaw is so preoccupied in satirizing the three dictators. Nevertheless, it is a fascinating document and it shows that Shaw at 82 was already trying to gauge the effect of television on world affairs. Blair Williams realizes this and often has the three dictators make their political posturings directly to the camera. The Shaw Festival last presented Geneva in 1988. If you don’t want to wait another 25 years to see this rarity, you will have to see it now even in this adulterated form. Let’s hope, however, that we don’t have to wait that long. The age of despots has still not past. And let’s hope that if the Festival does stage the play again it can manage to condense it leaving Shaw’s words intact and foregoing mediocre contemporary excrescences. Photo: (top) Lorne Kennedy, Sanjay Talwar, Neil Barclay and Ric Reid; (upper middle) Diana Donnelly and Andrew Bunker; (lower middle) Jeff Meadows and Patrick Galligan. ©2013 Emily Cooper.